HEAT & A/C BLOWER HAVE A MIND OF ITS OWN? * While this DIY is specifically addressing replacement of the blower final stage unit in the E53 X5 (01-06) models, the general procedures are applicable to the late E36 3-series (96-98/99), E46 3-series (98-05/06), E39 5-series (97-03), E85/86 Z4 (03-08) and E83 X3 (04-10). 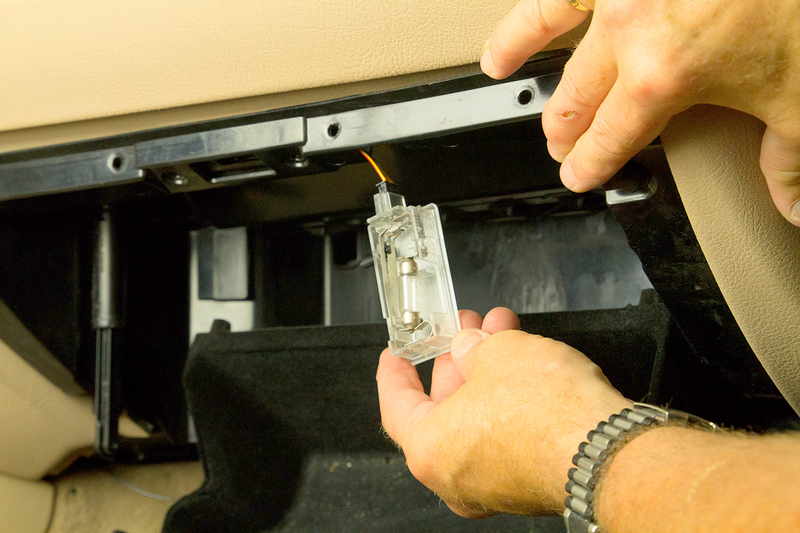 Specific details on the differences in trim panel removal are available in the applicable Bentley Publishers repair manuals. 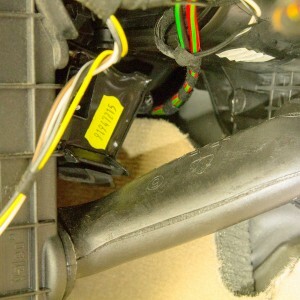 One of the most common problems on later model BMWs is for the heat and A/C blower control to fail. This causes the blower motor to run at varying speeds or not at all, or even to run continuously (not shut off). Changing the blower speed input on the climate control panel may have intermittent or no effect on the actual blower speed or operation. The most typical cause for these symptoms is a faulty blower final stage unit (commonly known as the blower resistor). 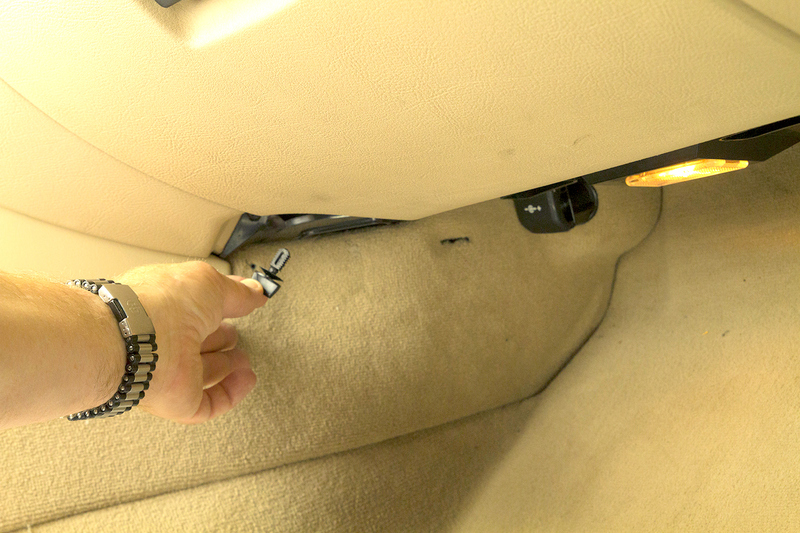 Later model BMWs (generally from the late ‘90s-on, with digital climate control panels) use a continuously variable blower speed control as opposed to the earlier models that have three or four specific blower speeds that are chosen via a control knob or dial. This continuously variable control is accomplished through a digitally modulated “final stage unit”. These final stage units do eventually fail and as noted above, the common symptoms may include; blower motor will not change speed per the climate control inputs, blower motor changes speed on its own when not in “auto” mode, blower motor does not operate at all, blower motor will not shut off. If your BMW is experiencing any of these symptoms, it may need a new final stage unit. 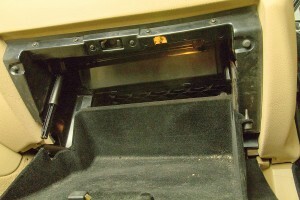 Most BMW models have the blower final stage unit mounted in the area forward and above the left side of the passenger foot well (above and to the left of the passenger’s left foot). (PHOTO #7605-1) In this DIY we will be replacing the final stage unit in an E53 X5 (2000-06). The final stage location and the general procedures shown will be very similar for many BMW models, including; E36 3-series, E46 3-series, E39 5-series, E85/86 Z4 and E83 X3. The Bentley repair manuals detail the final stage unit location and replacement procedures for the different models. 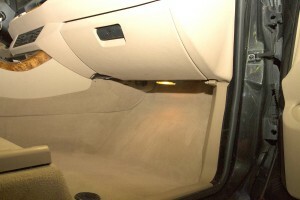 1) Remove the forward plastic trim panel. 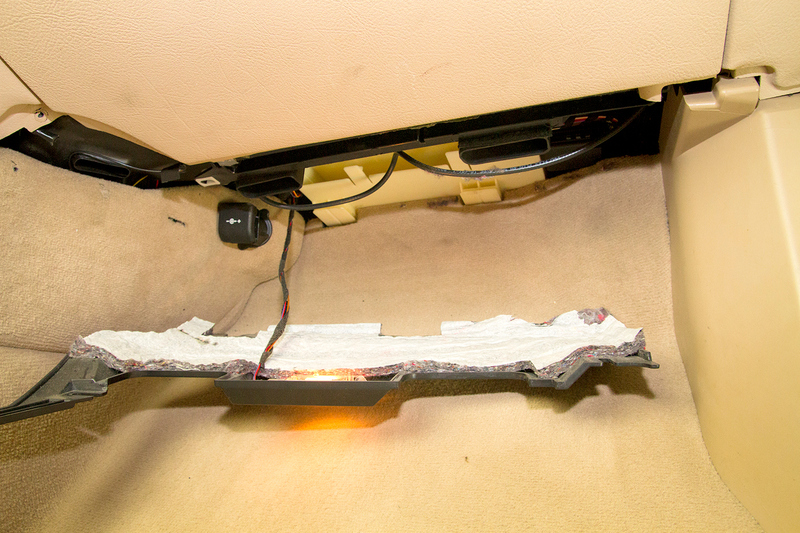 2) Disconnect the courtesy light wiring harness and remove the trim panel. 3) Press out and remove the damper securing pin. 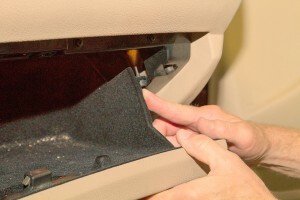 4) Press the right side of the glove box to allow the stopper to clear the frame so the box can be lowered. 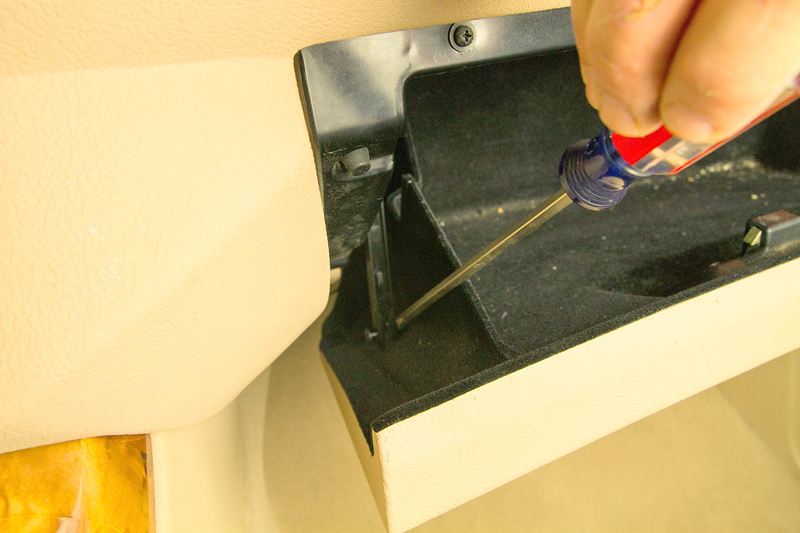 5) Remove the 6 Phillips-head screws securing the glove box assembly to the dash. 6) Pry the glove box light down and disconnect the wiring harness. 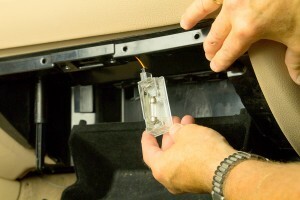 7) Lower the glove box assembly and remove it. 8) Push side console trim panel forward to release rearward clip, after removing phillips-head screw. 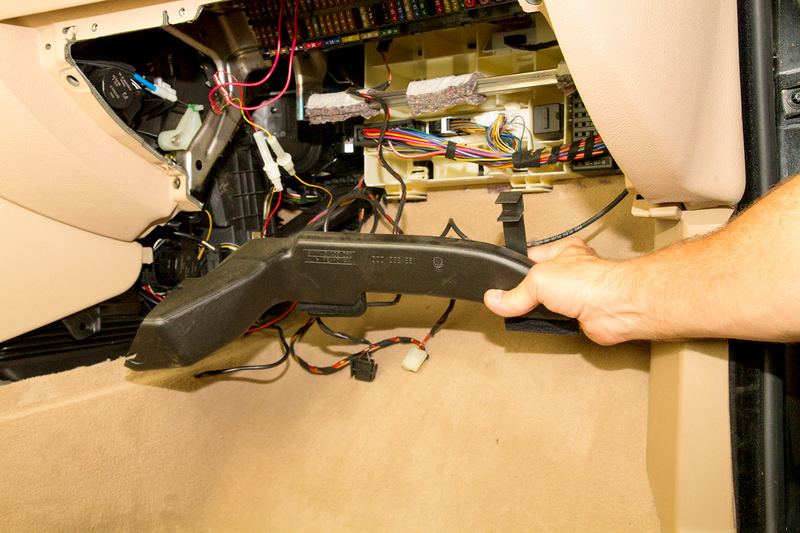 9) Unclip and remove the foot-well air duct. 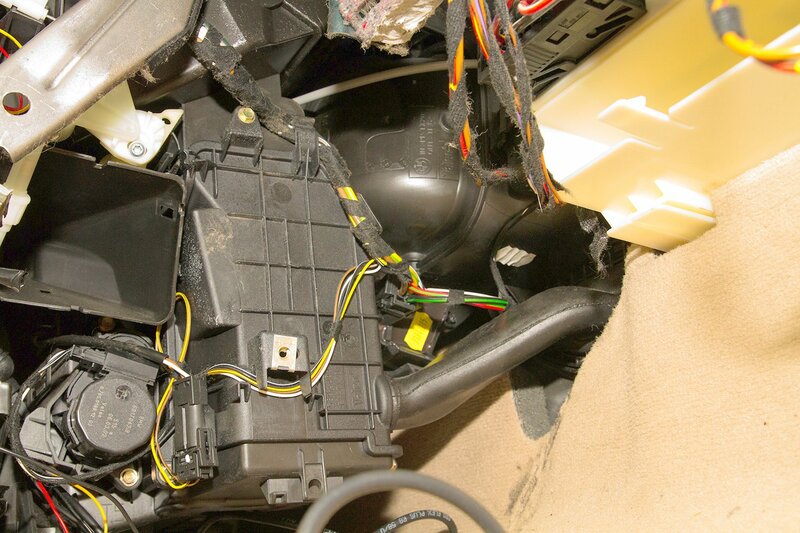 10) Locate the final stage unit by looking for the wiring harness plug. 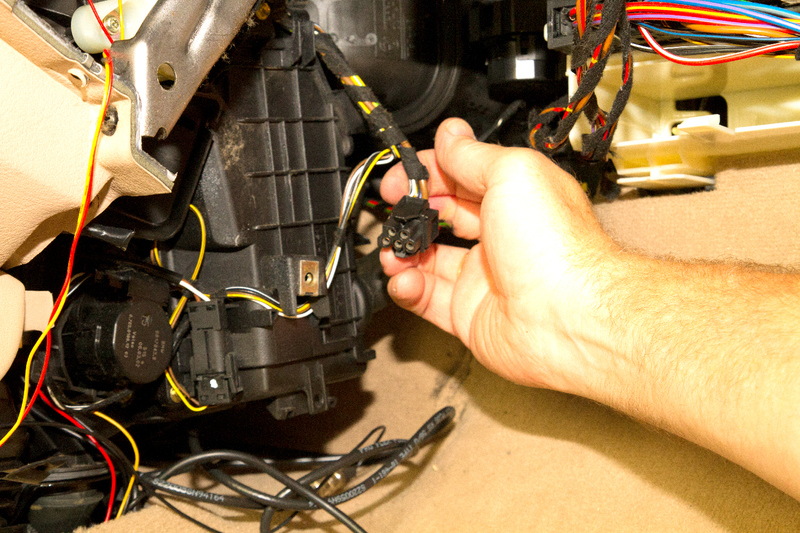 11) Pinch the release clips and remove the harness plug. 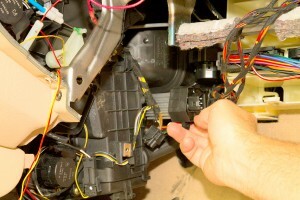 12) Push down on the securing clip and pull the final stage unit out of the blower housing. 13) Insert the new final stage unit into the mounting hole. Align the two alignment pins with the two alignment ears on the unit. Press the unit in fully until the securing clip snaps over the edge of the final stage unit. 14) Finish installation by installing the final stage harness plug, footwell air duct, side console trim panel, glove box and forward under-dash trim panel. Wanted to let you know how much I enjoy your web site and DIY videos. I’m an A&P mechanic and can’t seem to put my tools down – it’s therapeutic. Just w/in the last two years (after my wife had an accident w/her T-bird) I purchased a 2003 325I. Never even thought about owning a BMW and had the impression it would be difficult to work on; however, for the most part nothing could be further from the truth – truly a beautiful and well designed machine and a pleasure to drive, plus my wife absolutely ion love w/the car. Will admit however, the final stage unit on the 3 Series seems particularly challenging as the 3 doesn’t have the FWD under-dash panel (I wish it did). 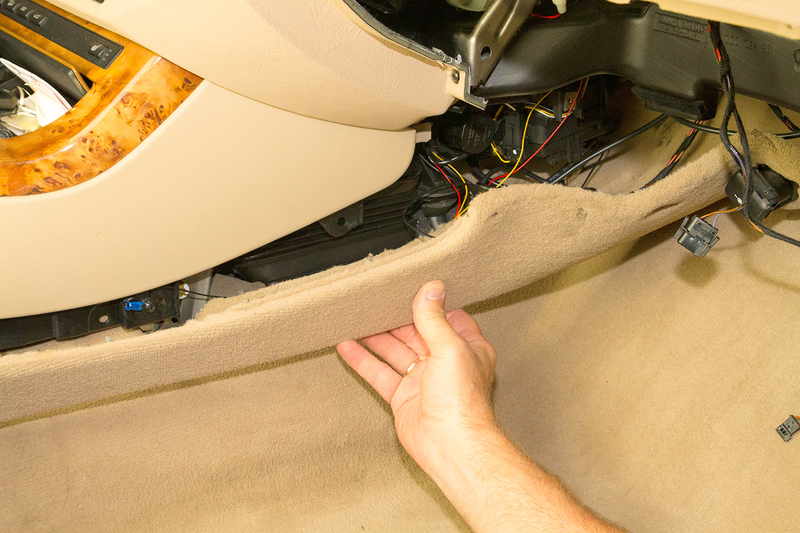 I have removed the glove box and under trim panels as stated in the Bentley manual but final stage unit is still obscured by the ducting and it seems you have to pull and pry to an uncomfortable extent to get access to the unit. I hate to admit it but I gave up and put everything back together. There’s got to be a better way. 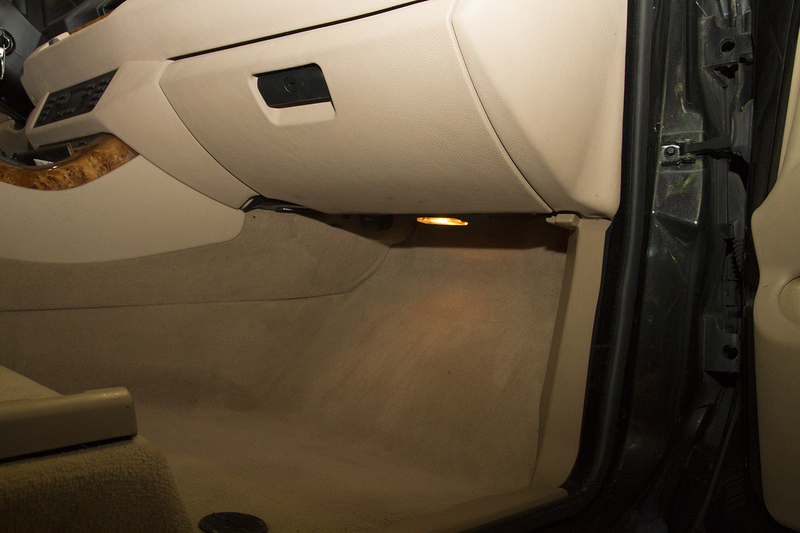 One thing for sure – on my next attempt I’m going to remove the pax seat for more room. Are there any tips you might share on this project for the 3 series. Anything would be greatly appreciated. Here’s a link to another video that is specifically for the E46 3-series models (99-05). the video is quite bad, but he does give all the details. Great. HOW about you do a video on replacing the Steering angle sensor on the x5 ,3,0 ,01 model year.. Better yet… do a rear upper arm and air bag replacement too. No current plans on the steering angle sensor. However, the Bentley repair manual for the E53 X5 does cover this. Same for the airbag replacement. We do have rear control arms on our DIY video list (same/similar for many X5, 5,6 and 7 models), but for now, the Bentley manual will cover it. Note that if your X5 has rear coil springs instead of the air-bags, you need to compress the springs before doing any control arm work. I loved your description of how to change the resistor up under the dash. It should be helpful to many people. I have a ’98 740iL, and recently had the Dealer replace the blower fan AND resistor. (It was expensive, but I can’t do that myself.) The fan speed is still erratic, and seems to have a mind of its own. Sometimes when set on “high speed”, it suddenly goes to an even higher speed. ~Is there another cause for this, or are we back to the resistor not working properly? Rick, From your description, it sure seems like the Final Stage (resistor) is at fault …. even though it is new. I can not see the videos for some reason, any of them. You may not have the appropriate video player installed on your device. Can you watch our videos if you go directly to youtube? Just search Bavarian Autosport and go to our youtube channel. 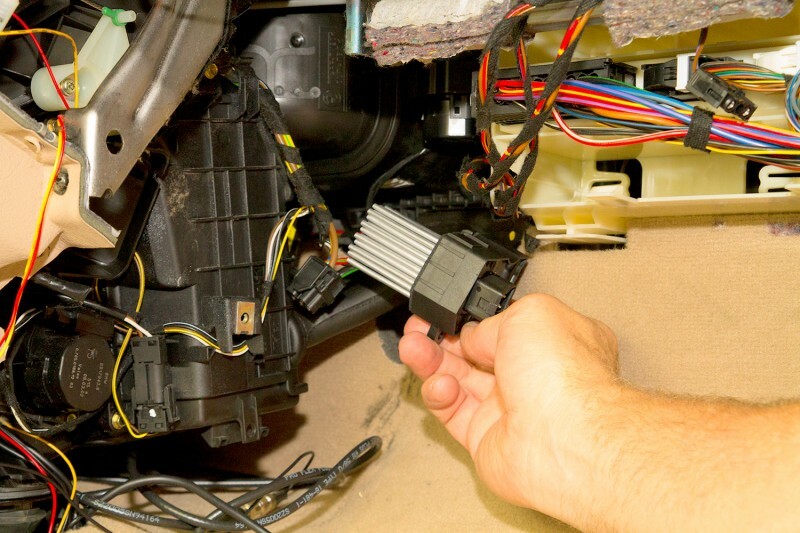 Do you have a video of removing and replacement of the blower motor unit for a E39? My blower is making noise after 3 bars on the blower indicator…..
We do not have a video for the E39. 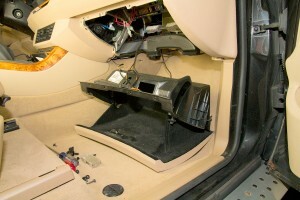 The Bentley repair manual for the E39 chassis does cover the procedures. Thank you very much, this was very enlighting . I needed to take out my glove box to get to one of my vent ,the hose or connecting line to vent came off and no air coming out. Mine revs like it’s being run by a generator and the power is about to fail.